Sasseur REIT offers exposure to China’s fast-growing retail outlet segment with 8.5% FY19F dividend yield, above its overseas-centric S-REITs peers’ 6.8-8.8%. Similar to a master lease, its rental structure provides downside protection, in our view, while offering potential earnings upside. We initiate on Sasseur REIT with an ADD rating and a DDM-based Target Price of S$0.92. Faster-than-expected tenant sales growth is a potential re-rating catalyst. Sasseur REIT (SGX:CRPU) is the first listed outlet mall REIT in Singapore which offers investors exposure to the most rapidly-growing part of the China retail value chain. Sasseur REIT has first-mover advantage in the prosperous Tier-2 cities of Chongqing, Bishan, Kunming and Hefei to capitalise on expanding private consumption appetite and rising number of middle-income households. Our site visits to these busy malls attest to the growing sophistication and aspiration of Chinese shoppers to branded consumerism. Some of the luxury brands at the outlets include Gucci, Coach, Armani, Michael Kors, Ermenegildo Zegna, Salvatore Ferragamo, Bally Nike, Polo Sports and Calvin Klein. We believe Sasseur REIT has a strategically-positioned retail outlet portfolio. It has assets located in key Tier 2 cities in Chongqing, Bishan, Hefei and Kunming, where rising urbanisation and growing income levels have led to high discretionary consumption over 2012-2016. Sasseur REIT's portfolio comprises four assets with a total net lettable area (NLA) of 304,573 sq m, valued at Rmb7.7bn (S$1.54bn) as at Dec 2018. Its largest asset by NLA is Sasseur (Heifei) Outlets, which account for 45% of portfolio NLA (33% of value) while the Sasseur (Chongqing) Outlets is the largest by value at 36% of portfolio value (16% of NLA). In terms of sales, Sasseur (Chongqing) Outlets generated the largest sales (Rmb1,731.4m) from 28 Mar to 31 Dec 2018. In order to provide a differentiating factor for its assets, Sasseur REIT positions its outlet malls as shopping and lifestyle destinations with unique "Super Outlet" concepts. Outlet malls differ from traditional malls in terms of tenant mix. Sasseur REIT has a total tenant base of 1,196 tenants across four outlet malls (as at Dec 2018). The Sasseur (Chongqing) Outlets has 414 stores carrying 600 international and domestic brands. The Sasseur (Bishan) Outlets, which opened in Oct 2014, has 213 stores carrying 350 brands. Hefei and Kunming outlet malls opened in 2016. The Sasseur (Hefei) Outlets has 316 stores with 450 brands and the Sasseur (Kunming) Outlets has 254 stores with 350 brands. The brands found at these outlet malls include luxury brands such as Gucci, Coach, Armani, Michael Kors, Ermenegildo Zegna, Salvatore Ferragamo, Hugo Boss, Max Mara and Bally as well as mid-market brands such as Nike, Fila, Adidas, New Balance, Polo Sports and Calvin Klein. There are also leading local brands. All in, international brands account for c.15.1% of NLA and 23.4% of revenue at end-FY18. The largest tenant contributed 5.2% to portfolio revenue and the top 10 tenants make up 17% of portfolio revenue. According to Outlets Leader magazine, the Sasseur Group is ranked amongst the top 5 outlet mall operators in China in terms of sales revenue in 2017, with total sales of Rmb3.4bn. The best performing outlet malls within its portfolio include the Chongqing and Nanjing outlets. During our visits to three of the four properties in the portfolio in Sep 2018, we observed that shopper traffic was robust and sales activity, brisk. The key difference between traditional shopping malls and outlet malls is the high conversion ratio from shopper traffic to paying customers given that outlet malls tend to be destination locations. According to China Insights Consultancy market research, the outlet mall industry in China has enjoyed strong growth momentum since 2012, expanding from Rmb16.8bn (US$2.5bn) in sales revenue in 2012 to Rmb49.1bn (US$7.4bn) in 2016. According to Jones Lang LaSalle (JLL), the outlet mall sector saw further growth in 2017 alone, with the top 20 operators chalking up Rmb40.9bn (US$6.5bn) of sales in 2017, a 20% increase y-o-y. This compares with a more modest 9.5% overall retail sales growth over the same period. China Insights Consultancy expects China's outlet mall sales to reach Rmb144.9bn (US$21.8bn) by 2021F and Rmb640.2bn (US$96.3bn) by 2030F, surpassing the US market which it expects to reach US$95.1bn by 2030F. The sharp expansion in per capita consumption expenditure in China between 2012 to 2016 was due to the burgeoning middle class as well as the rising awareness of brand conscious shoppers, in our view. According to China Insights Consultancy, the proportion of middle income households is expected to grow from 109m in 2015 to 216m by 2021F or 15% of total Chinese population. Population growth aside, China Insights Consultancy expects China's per capita disposable income to increase at a 5-year CAGR of 7.8% between 2016-2021F to Rmb34,700. The strong growth in disposable income and middle-income population creates a large potential customer base for the retail market. With greater disposable income, Chinese middle class consumers, who are mainly from the lower tier cities, are becoming more sophisticated and discerning in terms of product branding and quality. To capture the rapidly growing middle income consumers, global names are increasingly moving further afield from China’s first-tier cities. According to a Jan 2019 media article published by Reuters, global luxury brands from Prada to LVMH are investing in China for the first time since the crackdown on conspicuous spending five years ago, focusing on smaller, less developed cities even as the world’s second-largest economy slows. According to McKinsey & Co, Chinese luxury shoppers spend over Rmb500bn (US$73bn) annually, representing almost a third of the global luxury market in 2016. While we believe the middle income consumers prefer higher quality branded and luxury goods, they are also price conscious. This allowed outlet malls to sprout all over mainland China in recent years, even as department stores found themselves struggling amid a slump in retail sales.The first outlet mall in China commenced operations about 15 years ago. Since then, according to China Insights Consultancy, the market size of China’soutlet mall market had grown to US$7.4bn in 2016, surpassing Japan’s outlet mall market size of US$5.7bn. Despite the strong sales growth of the outlet mall industry in the past to reach US$7.4bn at end 2016, it is still small compared with the outlet mall market in the European regions (market size of US$16.1bn (as at end 2016) and the US (market size of US$47.4bn (as at end 2016). Given the smaller market size, coupled with China’s huge population base of about 1.4bn in 2017, spending per capita in outlet malls in China is hence much lower than the spending per capita in the US. In 2016, US residents on average spent more than US$140 per capita shopping at outlet malls while Chinese citizens spent less than US$6 per capita at outlet malls over the same period. In addition to the much lower spending per capita, China lags behind the US, Europe and Japan in terms of the number and size of its outlet malls. According to China Insights Consultancy, while outlet mall per GFA per 100 residents in the US, Europe and Japan stood at 2.4, 1.0 and 0.5 sq m, respectively at end-2016, China’s outlet mall per GFA per 100 residents was only 0.4 sq m. The low spending per capita and penetration rate of outlet malls in China indicate that the development of outlet malls in China is still at an early stage and the market is far from being saturated. Another supporting growth factor for the outlet mall industry, in our view, is that the Chinese government has made efforts to reduce import duties for luxury goods while brand owners have also increasingly recognised that Chinese consumers are becoming more price conscious when it comes to luxury goods. The combined result has been a drastic decline in the price difference between luxury goods in China and the rest of the world since 2011. In 2011, luxury goods were on average 68% more expensive in China as compared to average global prices, but in 2017 they were only 16% higher, according to Jing Travel. According to China Insights Consultancy, the competitive landscape of China’s outlet mall industry is relatively concentrated, with the top five best-performing outlet mall operators commanding c.30% of the market in the country in 2017. Sasseur REIT's sponsor, Sasseur Cayman Holding Ltd, is the largest outlet mall operator in China, in terms of number of malls (as at Mar 2017). In 2017, the group operated nine outlet malls, comprising the four properties in the initial portfolio, two ROFR properties (Xi’an and Guiyang outlets) and three pipeline properties (Nanjing, Hangzhou and Changchun outlets). Bailian (Unlisted) is the second-largest operator in China with six outlet malls. This is followed by Scitech (Unlisted), Beijing Capital Land (2868 HK) and Reno de Medici SpA (RDM SM). To stay ahead of the curve as one of the major players in the outlet mall industry, Sasseur REIT’s business model has evolved to meet changing consumer demands and the competitive landscape. It adopted a unique "Super Outlet" business model which it describes this as a “1+N” business model. This business model offers an integrated shopping destination where the unique lifestyle experience is based on a combination of art in the design and decoration of its outlet malls. “1” represents the outlet mall's business platform and “N” reflects the various lifestyle options offered at each outlet. Such "Super Outlet" concepts can be found at its Bishan outlet mall, where there is a Super Children’s Centre and Super Sports Hall along with several pubs and bars. Meanwhile, its Hefei outlet mall has one of the largest cinemas in east China and the first five-star cinema in Hefei under the UME cinema chain - 17 cinemas equipped with state-of-the-art audio and visual systems, and more than 2,500 seats. To widen this concept further, the sponsor intends to develop Phase 2 of the Hefei outlet to feature a Super Children’s Centre, Super Farm, Super Amusement Park as well as a hotel. In the Kunming outlet mall, future plans include addition of entertainment facilities for children, a cinema and additional restaurants. Sasseur REIT’s rental revenue is structured as an Entrusted Management Agreement (EMA) whereby resultant rent that is based on a blend of fixed base rent and percentage of tenant sales to provide income stability to unitholders. This will enable unitholders to enjoy downside protection while benefiting from potential upside from the improving performance of the properties, in our view. The underlying rental structure with tenants is similar to other concessionaires whereby rental structures are a combination of fixed and higher of fixed/turnover rents which are typically signed with F&B and entertainment (cinema) tenants as well as turnover leases which are signed with domestic and international brands. According to management, the underlying rental income is pegged to tenant sales and active asset management is required to drive tenant sales. As such, having an EMA rent structure provides unitholders with a more resilient income profile. Based on the recent FY18 results, about 65.5% of the EMA resultant rent structure is derived from the fixed component and the remaining from the variable portion. The fixed component comes with a 3% annual escalation from end-FY18 while the variable portion varies from outlet to outlet, based on percentage of sales. The variable component is calculated at 4% of retail sales for Chongqing outlet mall, 4.5% for Bishan outlet mall, 5.5% for Hefei outlet mall, and 5% for Kunming outlet mall. All in, the variable component made up 34.5% of EMA rental income for FY18. Portfolio occupancy stood at 95.2% at end-FY18. Most of the tenants enter into sales-based leases where the rent is determined solely based on turnover rather than fixed rent. As such, lease tenures are short at c.1.3 years by gross revenue and three years if based on NLA. Sasseur REIT indicated that an estimated 73.7% of its leases (by gross revenue) are expiring in FY19F with another 12.4% (by gross revenue) in FY20F. We expect the bulk of the FY19F lease renewals to be from Kunming and Hefei outlet malls which were opened in 2016. Given that active asset management is an important function to drive tenant sales, Sasseur REIT has signed entrusted management agreements (EMA) with its sponsor as the EM of its properties for 10 years from Mar 2018. The EM is responsible for the end-to-end management of the properties including managing tenant relationships and mix as well as facilitating rental negotiations and monitoring the sales performance of tenants. It will also manage the sales collection of the tenants and performs periodic checks on the brand authentication of the products sold by the tenants. This active asset management is bearing fruit as indicated by the strong 78% growth in outlet members to 819,200, and the sharp increase in shopper traffic in the Chongqing, Hefei and Kunming outlet malls. In addition, tenant sales continue to expand strongly, particularly at the newer outlet malls at Hefei (+53.6% y-o-y from 28 Mar – 31 Dec 2018) and Kunming (+58.5% y-o-y from 28 Mar – 31 Dec 2018). Sasseur REIT's sponsor, Sasseur Cayman Holding Limited, was founded by Mr Xu Rongcan in 1989. It leverages Mr Xu’s passion for art and culture to develop and design all of its outlet malls, offering a unique lifestyle experience for its customers. Its “Super Outlet” business model which incorporates outlet shopping and lifestyle experience (e.g. sports, children playground, farm) into a single shopping platform provides its customers a unique experience as compared to a traditional mall, in our view. Given its 28 years in the retail industry, the sponsor boasts a strong brand database of approximately 1,770 international and domestic brands as at Dec 2018. As at 2018, the sponsor has designed and implemented the development of six outlet malls, which comprise the four properties in the initial portfolio as well as the two ROFR properties – Xi’an outlet which commenced operations on 30 Sep 2017 and Guiyang outlet which commenced operations on 9 Dec 2017. The total sales performance of the four properties in the initial portfolio was encouraging at 10.7% CAGR in 2014-2018. It also manages another three pipeline properties (in Nanjing – opened in 2015, Hangzhou – opened in 2011 and Changchun – opened in 2017). There are another four new pipeline properties, in Changsha, Lanzhou, Yangzhou and Shenzhen, scheduled to be opened from 4Q18 to 4Q20F. Since its inception in 1989, the Sasseur Group has established a strong presence and track record in China. In Nov 2018, Sasseur Group signed a Memorandum of Understanding (MOU) with YCH Group, a leading integrated supply chain management and logistics service provider, to explore areas of collaboration in optimisation and integration of warehousing and distribution, intelligent distribution solutions, data analytics and strategic marketing for customers at all Sasseur retail outlets. Under the MOU, YCH will offer its proprietary omni-channel platforms including membership service, finance, big data technology and smart technology to collaborate with the Sasseur Group. Building on the company’s strength, the companies will also offer end-to-end supply chain and logistics management capabilities such as warehousing and distribution networks to the merchants in Sasseur Group’s outlet malls with the objective of building an intelligent distribution system with big data and providing customers with comprehensive and better quality services. YCH will also leverage data analytics capabilities to further improve the online and offline marketing strategies for Sasseur Group to enable better tenant and consumer analysis to improve customer experience. The integration of warehouse and distribution will enable tenants to reduce logistics costs. In Oct 2018, Sasseur Group signed an MOU with Meritz Securities Co Ltd (008560 KS) to explore potential strategic collaboration to develop the outlet mall business in Korea by leveraging their respective expertise. As at 13 Mar 2019, Meritz Securities is an investor in Sasseur REIT, with a 6.57% stake in Sasseur REIT, and a 42.99%-owned subsidiary of Meritz Financial Group (138040 KS). Under the MOU, Sasseur Group can tap Meritz Financial Group’s network and expertise in Korea’s financial services industry. Sasseur Group will favour Meritz Securities as the first option for financial services or investment pertaining to its future business developments in Korea. Similarly, Meritz Securities will provide necessary financial support and advice to Sasseur Group with respect to the Korean market. 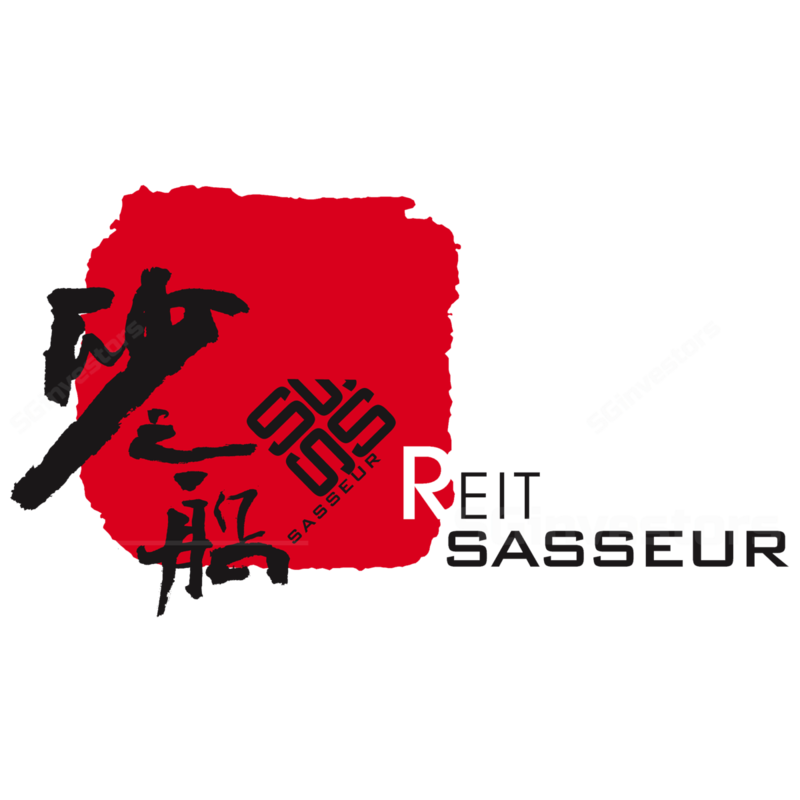 Sasseur REIT has strong endorsements from its strategic shareholders such as L Catterton Asia and Ping An Real Estate. We believe L Catterton Asia provides a solid platform for the sponsor to grow its brand portfolio whilst Ping An Real Estate brings an extensive network of properties and potential third-party acquisition possibilities. Sasseur REIT is supported by a dedicated and experienced management team, in our view, with deep and broad experience across retailing, fund management and real estate sectors. The REIT manager, Sasseur Asset Management Pte Ltd, is helmed by Mr Anthony Ang (CEO), Mr Fred Chee (CFO), Mr Ken Chew (CIO) and Mr Chen Zhen (Head of Investor Relations, Compliance and Risk Management). We believe the management team has significant domain market knowledge and deep experience in this market. Sasseur REIT's fee structure aligns the interest of the REIT and major shareholders. Base fee is calculated at 10% of distribution income (before management fees) and performance fee is pegged at 25% of the yoy change in dividend per unit (DPU). FY18 annualised base fee equates to 0.52% of assets under management (AUM). This is in line with the average as at Dec 2018 of 0.5% for S-REITs and 0.3- 0.5% for China-centric S-REITs – CAPITALAND RETAIL CHINA TRUST (SGX:AU8U), BHG RETAIL REIT (SGX:BMGU), DASIN RETAIL TRUST (SGX:CEDU), EC WORLD REIT (SGX:BWCU) – and HK REITs – Hui Xian (87001 HK), Yuexiu (405 HK). Continue reading: Sasseur REIT - Brand Experts (Financial Analysis, Valuation & Recommendation).